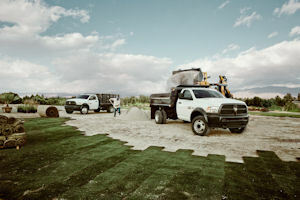 Refined styling isn’t what made the Ram Chassis Cab legendary. It was the raw power, brutish strength, and reliable toughness. That’s what the 2013 Chassis Cab delivers, along with a whole host of class-leading features: GCWR (37,500 lb), towing (29,600 lb), and diesel torque (750 lb-ft). With an unsurpassed 5-year/100,000-mile powertrain warranty, it’s the truck you’ve always wanted your truck to be.